Today on the Tales of a Red Clay Rambler Podcast I have an interview with Matt Wedel. 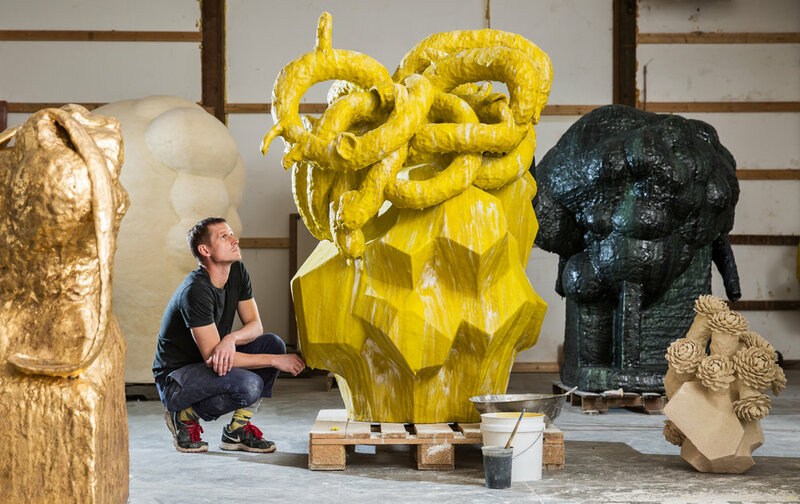 He uses a gestural sculpting style and vibrant glazes to create ambitious large-scale works around the themes of the figure, landscape, and what he calls “Flower Trees”. In the interview we talk about keeping up with the speed of his imagination, understanding color and surface, and the place of ceramics in the art world. To see examples of his work visit www.mattwedel.com or www.lalouver.com. Hey Red Clay Rambler fans, in the lead up to this year’s NCECA conference in Minneapolis I want to mention a few events that will be happening. The first is Penelope Van Grinsven’s Reprocessing Project. She will be in the project space March 27th-29th smashing ceramic pieces that participants bring to the conference. She says of the project, “I think there will be something beautiful and unnerving about ceramists breaking their pieces together in one space. Reprocessing will take a private activity that we all engage in and make it public.” In exchange for one piece, each participant will receive a postcard that contains a few shards from the project in a small plastic container. For more information on Penelope visit www.penelopevangrinsven.com.